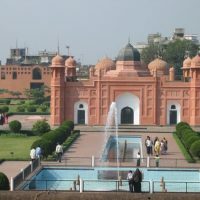 Shait Gumbad Mosque is the largest of the Sultanate mosques in Bangladesh and one of the most impressive Muslim monuments in the whole of the Indian subcontinent. 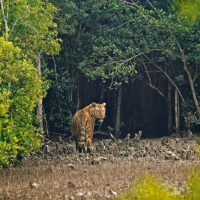 It is ascribed to one Khan al-Azam Ulugh Khan Jahan, who conquered the greater part of southern Bengal and named the area khalifatabad in honour of the reigning Sultan nasiruddin mahmud shah (1435-59). 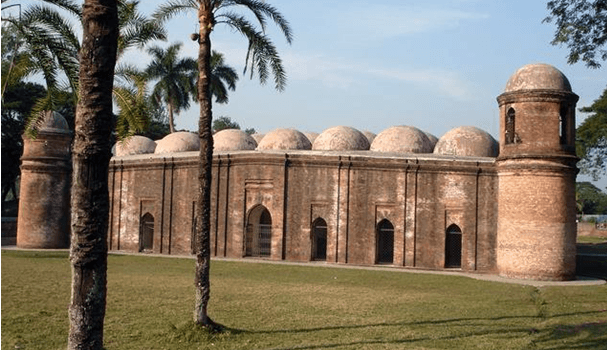 khan jahan ruled the region with the seat of administration at Haveli-Khalifatabad, identified with present Bagerhat, till his death in 1459. Such a magnificent building turned into miserably decaying condition with the passage of time. 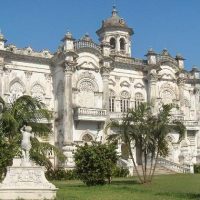 It is however fortunate that the British government initiated measures for its restoration and repair and the process continued under the direct supervision of the successive Departments of Archaeology of Pakistan and Bangladesh. 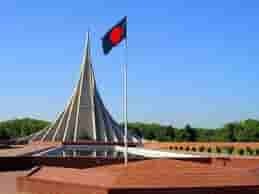 In the early 1980s an effective long-term programme was undertaken to safeguard this historical monument at the instance of UNESCO, and the work is nearing completion. The most attractive part of the mosque is its large central nave, running east to west in a longitudinal line. This nave, consisting of seven independent oblong bays about 4.88m by 3.96m each, divides the interior of the mosque into two equal wings and opens out to north and south by pointed archways. The side wings are divided into square bays, numbering seventy in total. The square bays of the side wings, each measuring 3.96m on each side, are covered with inverted cup-shaped domes, while the oblong bays of the central nave are roofed over with chau-chala vaults. 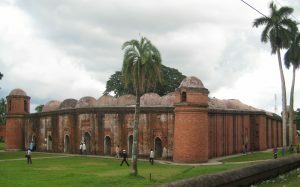 These vaults and cup-shaped domes are carried on intersecting arches springing from the pillars, and the corners between the arches are filled with characteristic Bengali pendentives. The building thus exhibits eighty-one domes in total – four on the corner towers, seventy over the side wings and seven chau-chala vaults over the central nave. The north and south walls are internally marked with decorative cusped niches, twelve in each wall. Each of these niches is topped by a couple of mouldings. While these mouldings show rosettes alternating with diaper motifs, the space in between is ornamented with floral scrolls in terracotta. An important feature of the mosque, though unusual in Bengal but noticed in many congregational mosques in northern India, is a small doorway in the back wall beside the central mihrab, the idea of which might have originally been borrowed from those of early mosques in Islam. In early Islam the postern opening of the mosque is known to have been used exclusively by the caliphs, governors or Imams. It is therefore not unlikely that the western doorway of the Shatgumbad Mosque was reserved for Khan Jahan, the governor of Khalifatabad, who had his residence a few yards away to the north of the mosque. Of the two brick platforms, already cited, the one near the central mihrab was perhaps used by Khan Jahan while transacting administrative business, and the other near an eastern doorway was perhaps meant for a religious teacher, who sat on it and expounded Islamic teachings to the people or students. The Shatgumbad Mosque therefore appears to have served triple purposes – a congregational mosque, a parliament or assembly hall like those of early Islam and a madrasa like the Isfahan Jami and the Masjid-i-Jami at Ardistan in Persia.